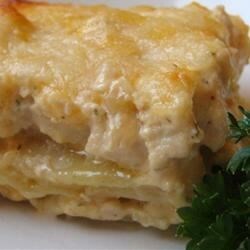 "Lasagne made with ground chicken or turkey in a white sauce. Serve with a green salad and you have a complete meal!" Cook lasagna noodles in boiling salted water until al dente. Rinse with cool water, drain well. In a large skillet, cook and stir ground turkey or chicken, chopped onions and green pepper over medium heat until golden brown. Drain excess grease. Mix in cream of mushroom soup, cream of chicken soup, and evaporated skim milk. Cook mixture until it comes to a low boil. To assemble, in a buttered 13x9 inch casserole dish layer 1/2 cup of the sauce, 3 lasagna noodles, 1/2 cup of sauce, cottage cheese, one half of the shredded mozzarella cheese, 3 noodles, remaining sauce mixture. Finish with remaining shredded mozzarella cheese. In a preheated 350 degree F(175 degree C) oven bake for 45 to 60 minutes. Cook until heated through and bubbly. Let stand for 10 to 15 minutes before serving. This was okay, It needs something though. I even added a ton of fresh mushrooms and that wasn't enough. I don't think I would make it again, it is all too much one color, just blah. I really liked the chicken lasagna recipe, but I added spinach and used baked chicken that had been chopped up as opposed to the ground chicken. Thumbs up from picky husband - and that's saying something! I used broccoli instead and green pepper, two cans chicken instead of ground chicken. It's a keeper - thanks! Wow! Better than I expected. Very good and easy. I also added mushrooms which it needed.